Roast the sesame seeds over slow fire for 2 mins till they get crisp. Stir constantly while roasting so that it does not get burnt. Grind the seeds and make into a powder. 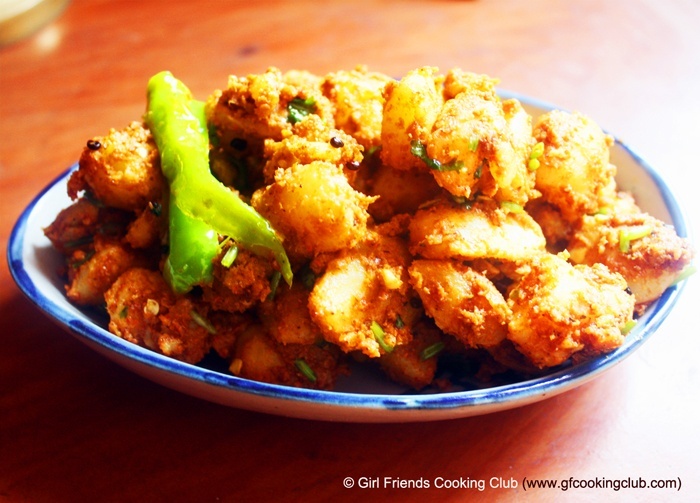 Cut the potatoes into medium sized cubes and add chopped coriander, salt, chilli powder ,sesame powder and ginger garlic paste and mix thoroughly. Heat the oil in a pan and add the fenugreek seeds. When the seeds starts spluttering, add the slit green chillies. Fry for 5 seconds and remove from heat. This entry was posted in Nepali Food Recipes, Pickles & Chutneys, Salads, Snacks & Appetizers, Vegetables and tagged Nepali Cuisine, Nepali Recipes by Kamakshi. Bookmark the permalink.